In the last couple of months I’ve heard a few times, “Our family can’t afford to eat a healthy diet.” The statements were not from those without jobs, so it sent my thoughts scampering to figure out why? Actually, I ended up with lots of questions; and maybe a few answers. Have people ever calculated the amount of money it would take to buy ingredients for soups, casseroles, stews, and stir-fries? Have people tried the inexpensive cuts of meat? Are people used to throwing a steak or chop into the broiler or Barbie? (I recently adopted the Australian word for barbecue). Are people so used to not budgeting any time for meal preparation and grocery shopping that they think they don’t have the time? Do a large percentage of the population lack cooking skills, so are afraid to even think about cooking? Do people think that they could possibly decrease their budget for their many health care costs, by eating a healthy diet? This question requires a long-term perspective to answer – pay for the vegetables now or the doctor later. Are we as a nation so used to really impoverished, cheap food-like substances, that it’s difficult to pay for real food? Try less expensive cuts of meat and poultry. Make your most expensive ingredients go farther; for example, instead of serving a steak for each individual, slice it for a stir-fry; or chop it for a casserole. Serve some meatless meals; it’s actually the goal of many who can afford to eat whatever they desire – a healthy alternative. Buy produce in season (by the way, in season can be somewhere in the world – the point is that the price is down when it’s in season). If you’re not too familiar with what is in season, look at the Sunday papers or Wednesday, whenever the food advertisements are published. You will see several markets all advertising the same produce. It used to be called a ‘loss leader’ – something that would get you to come to their market. Go to some of the websites that publish recipes that are kind to the budget. There are millions of hits if you Google: budget recipes. The following two seemed interesting. Family.go.com and frugalfamilyrecipes.blogspot.com/ Certainly, all the recipes on these sites are not recipes that I would encourage for healthy eating, but maybe you or your friends will find this website to be one resource where you can find recipes that are healthy as well as budget wise. One technique that I used when money was tight and my family was young was to buy multiple chickens when they were on sale. Then I would cut them up, storing the meaty pieces in the amounts to feed a family meal and storing the bony parts to make soup or casseroles. When turkeys were on sale I’d buy a couple of extras and put them in the freezer. 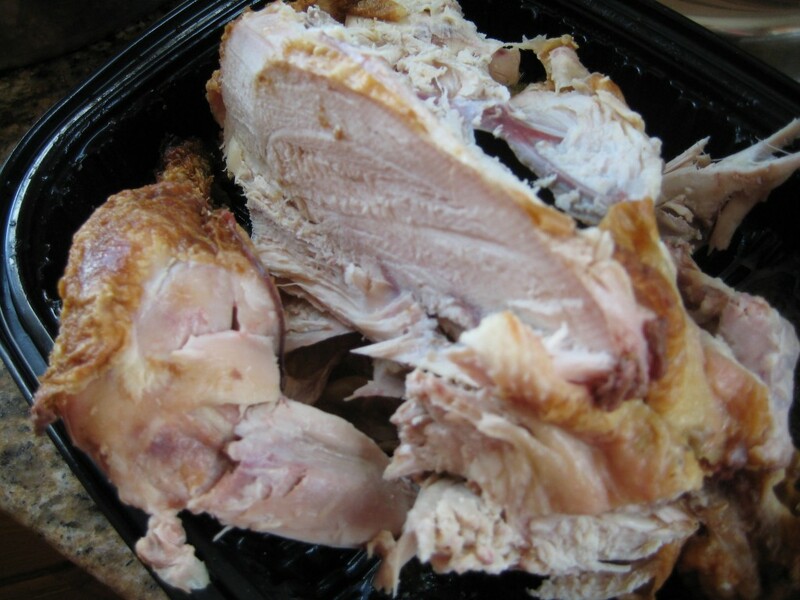 I’d cook the whole turkey and chop up the meat and store it in recipe ready amounts, about 1 ½ cup chopped cooked turkey. Try to find a good produce market. There is one in my town called Sunflower Farmer’s Market; the produce is a very nice quality. I purchase some of my produce for as much as a dollar per pound less than other local grocery stores. Since we eat so many vegetables, it’s worth stopping there. Above are just a few of my suggestions about some peoples’ perceptions that healthy food is too expensive. An actual example will perhaps make it more vivid; see below. I will admit that I am not on a food budget; there are no longer children to feed (except at large gatherings). Our desires are not extravagant, but we can afford to eat the good foods that attract us. Having said that, it turns out that many of the foods that nourish us well and those we sincerely enjoy, are really not expensive. We don’t eat very much meat, but I do frequently buy nice fish and we eat a considerable number of meatless/fishless meals. So even in the relatively comfortable situation of grandparents with adequate means, I think we do very well in keeping food costs at a modest level. This example below happened just a week ago. It was just part of our ‘real life.’ I took some pictures of the soup at the time; but had no idea how I would use the pictures – I just took them. Now that I’m writing about the subject of healthy eating on a budget, I thought that I’d look up some facts and do a little calculating to see what we could learn about nutrition and whether it is really true that we can’t afford to eat healthily. My chicken noodle soup was a little different than Campbell’s traditional Chicken Noodle Soup, but I’m comparing it with that since it is one of the all-time favorite soups. Seven 10.5-ounce cans of Campbell’s concentrated soup plus 7 cans of water approximately equals the volume of my pot of soup – a little more than 18 cups of homemade soup. The traditional Campbell’s soup is about 99 cents per can – $6.93 to equal the volume of the homemade soup. So at first blush, the price difference is a full $3.02 cents, or 68% more. This is what it costs you to have the convenience of opening a can and not having to chop anything – just add the water and pour into a bowl, and microwave. But are there not other costs for this convenience in not having to cook? This generated two new questions for me. Are you really satisfied with one can of concentrated soup, plus a can of water? These are a few more facts that I want to share before you make your own decision. First, one can of Campbell’s traditional Chicken Noodle soup provides 2,291 mg of sodium. If you’re trying to target a healthy intake of sodium (see article A Pinch of Salt Can Do the Job) that would be 99.6% of the top end of the desired sodium target range. (Sodium target 1,500 to 2,300 mg/day) One teaspoon of salt in one can – good grief. Both canned versions are made with white flour noodles – the homemade version noodles were 100% organic whole wheat. The homemade soup had nice sized chunks of chicken – the canned soup had chicken flecks. 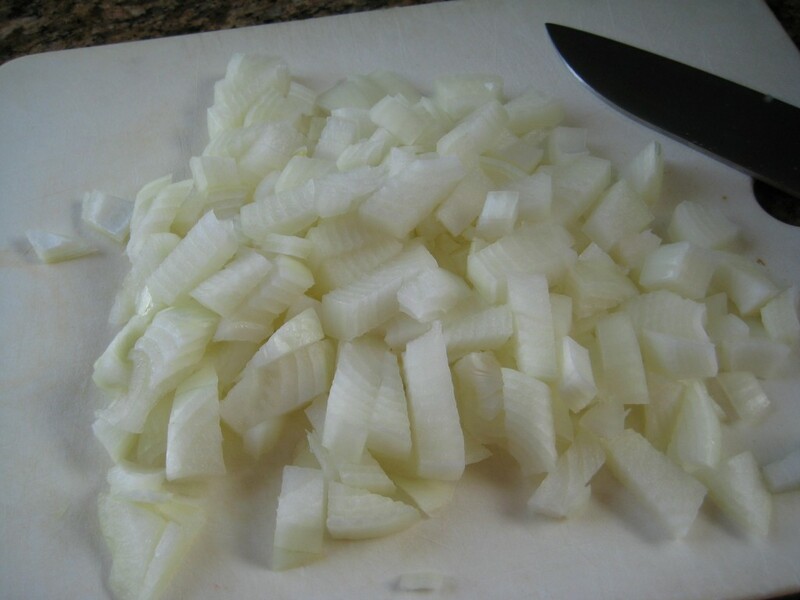 Homemade had from the earth onions – canned versions had onion powder or dehydrated onions in the low sodium version. You get a beta-carotene additive in the soup can. Why does the homemade not need a beta-carotene additive? First, these blogs reveal fully what I think of additives. Second, because the homemade soup has a full pound of real carrots with beta-carotene and many other carotenoids that color and enrich the soup naturally. Sweet red peppers are listed in the low sodium canned version; but, they weighed less than the yeast extract; we’re talking a tiny pinch of sweet red peppers. Why can homemade soup taste so great without the extensive list of ingredients with chemical-sounding names? 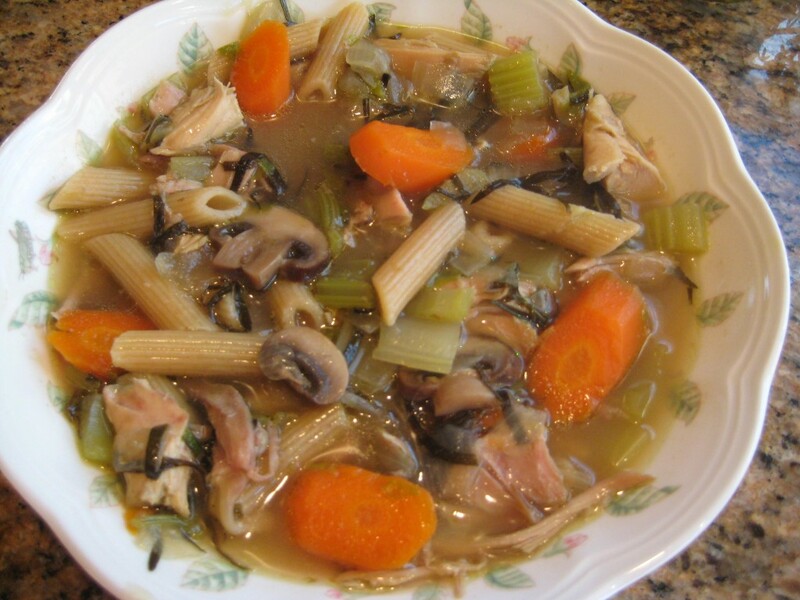 Because it has a generous amount of real vegetables, herbs, whole grains and chicken broth. Sodium is at 99.6% of the upper end of the daily sodium goal of 2300 mg sodium. In comparison, the pot of homemade soup has ½ teaspoon salt (1150 mg sodium for 18 cups of soup. In addition, the 18 cups yields 3 nourishing tasty meals for 2 people. With all those yummy vegetables, herb flavoring, and meat, you don’t need all that salt to make it taste like something. The homemade version had lots of herbs, vegetables, and whole grains; and all the antioxidants, vitamins and minerals that come with whole foods. It didn’t need synthetic vitamin and mineral additives, nor do we want them or the preservatives or artificial flavors. Why can I get away with fewer ingredients? 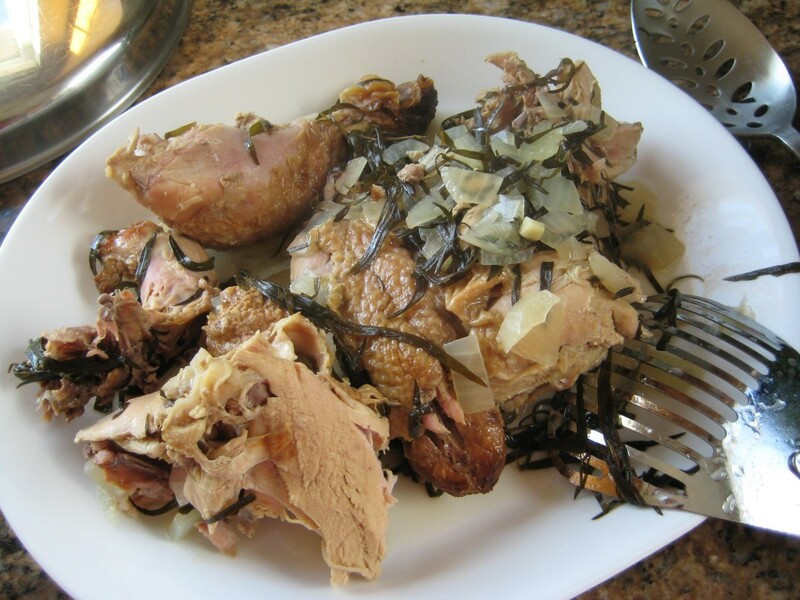 When the chicken carcass with all the bones is boiled, some of the gelatin comes from the bone marrow – it gives the broth body - a nice consistency and flavor. So no cornstarch, potato starch, or modified food starch is necessary. Chicken stock, enriched egg noodles (wheat flour, egg solids, niacin, ferrous sulfate, thiamine, mononitrate, riboflavin, folic acid), cooked chicken meat, water, contains less than 2% of the following ingredients: salt, chicken fat, cooked mechanically separated chicken, monosodium glutamate, cornstarch, onion powder, modified food starch, yeast extract, spice extract, soy protein isolate, sodium phosphates, beta carotene for color, chicken flavor (contains chicken stock, chicken powder, chicken fat), flavoring, dehydrated garlic. INGREDIENTS: CHICKEN STOCK, COOKED CHICKEN MEAT, ENRICHED EGG NOODLES (WHEAT FLOUR, WHOLE EGGS, EGG WHITES, NIACIN, FERROUS SULFATE, THIAMINE MONONITRATE, RIBOFLAVIN, FOLIC ACID), WATER, CARROTS, CELERY, CONTAINS LESS THAN 2% OF: POTATO STARCH, SAUTERNE WINE, CHICKEN FAT, YEAST EXTRACT, SWEET RED PEPPERS, SUGAR, DEHYDRATED ONIONS, POTASSIUM CHLORIDE, DEHYDRATED GARLIC, MODIFIED FOOD S STARCH, SPICE EXTRACT, SODIUM PHOSPHATES, DEHYDRATED PARSLEY. 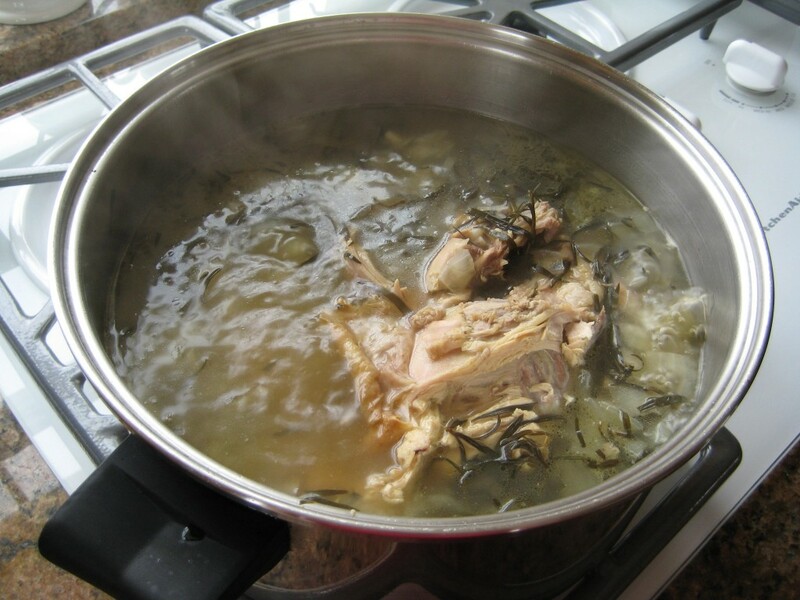 Put chicken carcass in a stockpot; cover with water. Add tarragon and onions. Cover and simmer for an hour or two, until the chicken easily comes off the bones. Remove all the chicken and bones with a slotted spoon. 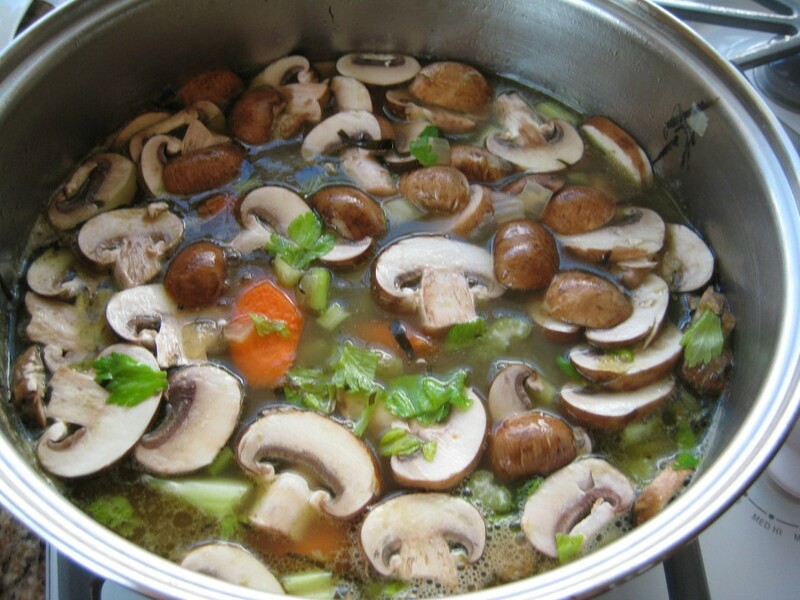 Add the celery, mushrooms and carrots and simmer. Cool the chicken until cool enough to handle. 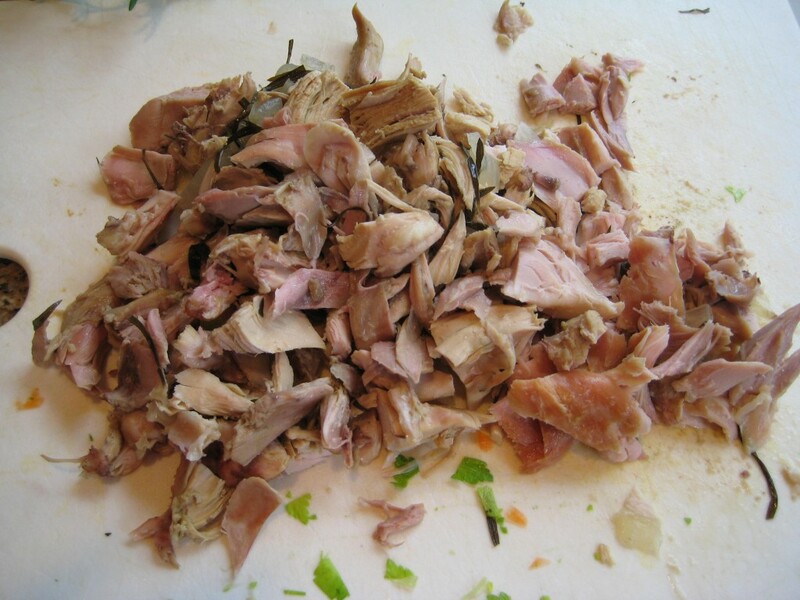 Debone the chicken and remove any skin or visible fat. When the vegetables are almost tender add the pasta – cook according to the package directions, about 13 or 14 minutes. Add ½ teaspoon of salt, or to your taste. Start with a chicken carcass. Chop up a big onion. 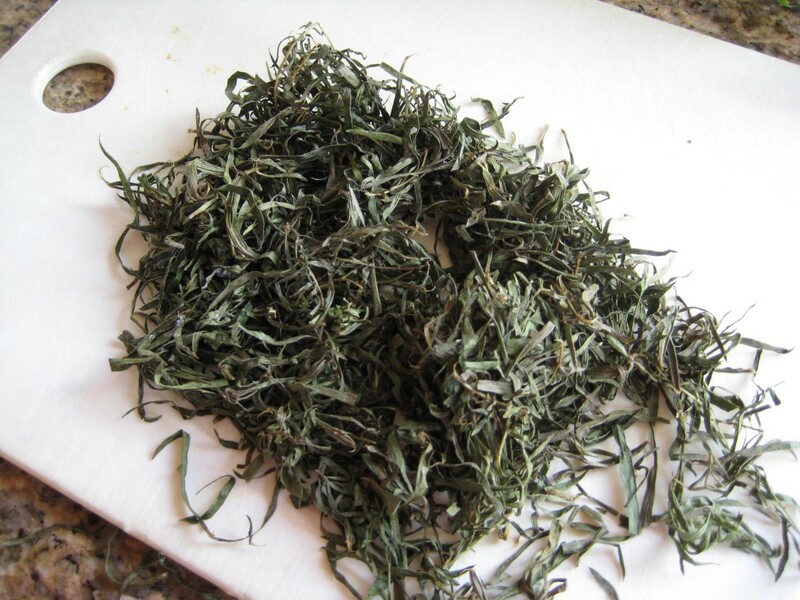 A bunch of frozen tarragon from my freezer, or just use herbs from your spice rack. Simmer the chicken, onion and tarragon. Lift the chicken with a slotted spoon - allow to cool. 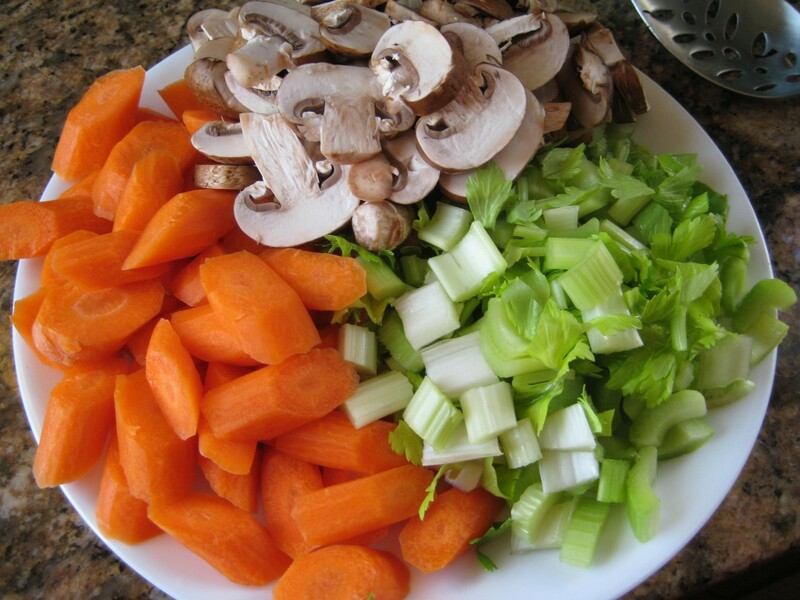 Add the chopped vegetables - use the vegetables that you enjoy. Discard the bones and skin; and chop the chicken. 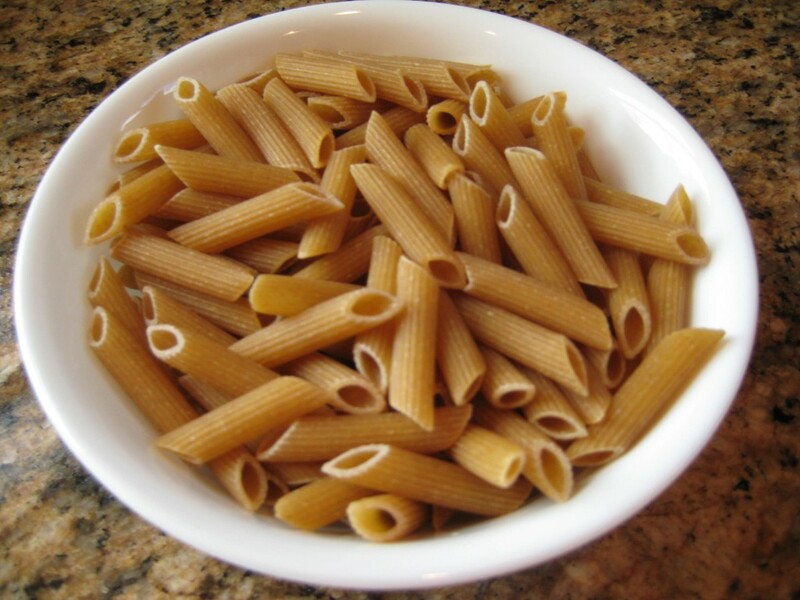 Add the whole wheat pasta. Enjoy your delicious soup today; cover and refrigerate what's left for another day. What did we learn together? Six meals for $4.40 (three meals each for two people), that’s enough to feed an entire family. Can you easily feed a family member for 73 cents each? I don’t believe that you could really say that canned chicken noodle soup is doing a good job of nourishing you or your family members; but for 73 cents of homemade soup you could say you did a good job. If you’re on a budget, take the time to cook real food. If the cooking time is too long, after you get home from work, make it on the weekend or the day before. Most of the time in making soup is the time it simmers. Make enough for several meals and save it in the fridge. This is a great laborsaving technique. In our case, it divides the work time by 3 so for each meal, it is definitely faster than driving to a restaurant, but it still takes longer than the total cooking and clean-up process using the Campbell’s cans and your trusty can opener. This convenience comes at a high cost. Just remember, the cost-benefit is not just in the food itself. The cost savings is also in medicines, doctors, and hospitals. This time and cost you will pay out is not noticeable at the time, because it will come years later – sometimes months later. It is hard for younger people to imagine the time when their bodies will become older and the payments for unhealthy habits will come due. Those of us who have arrived at those more advanced ages have seen and experienced the truth of these principles more poignantly.